Breaking up is painful for the person who truly loved, it is always hard to go through this. If your heart was broken and you are looking for the right words to express your sorrow and sadness, maybe you will find something on this page. Here we have lots of break up messages for her - girlfriend or wife. We hope that those words will help you to show what you feel. I’m tired of always being your number two. Everyone should have friends, but you can’t forget about your ex-boyfriend though. I cannot listen to your lies anymore. 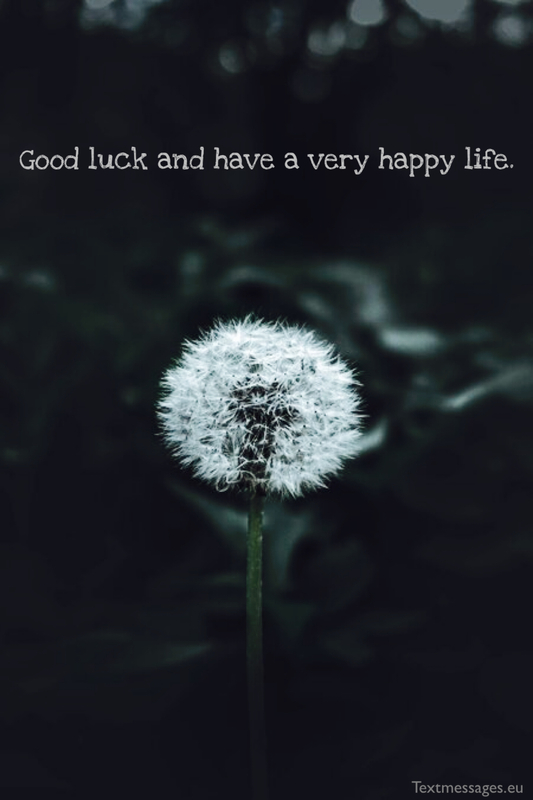 Good luck and have a very happy life. I know we’ve been together for a while, but I just don’t feel the same way about you as I did when I met you. I don’t want to hurt you by making you think that we can make this work. I hope that you will find someone who will love you more than anything in the world, cause you deserve it. It is hard for me to understand why our relationship didn’t work out. I thought that you and I were meant for each other. But life is full of surprises. I’m sorry, I’ve tried so hard, but there is nothing I can do to save us. Goodbye. Relationships are hard, but you can always make it work if you are interested in it. I don’t see any interest in you, that’s why I think we have to say goodbye to each other. Wishing you the best of all, good luck. You always complain that I never listen to you. Even when I do literally everything to make you happy and satisfied. I’m tired of that. Now you can go and see if anyone in this world can give you what you want. Good luck finding someone who will treat you better. Twenty four hours is not enough to explain you how much I don’t want this to end. But I feel like I don’t have a choice. I can’t talk with you the way I could when we first met, and that’s driving me crazy. 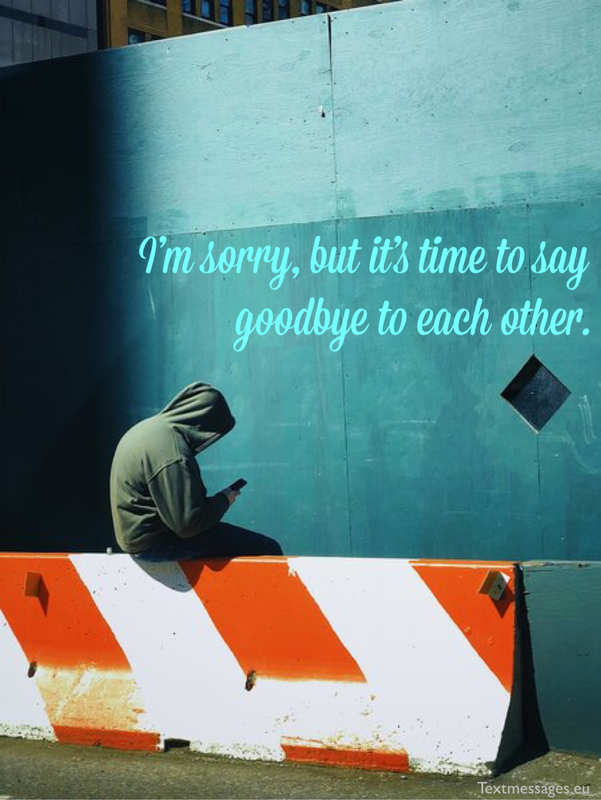 I’m sorry, but it’s time to say goodbye to each other. I gave you my heart, and you tore it into million little pieces. You don’t even feel sorry about the way you’ve treated me. But now it’s over. I’m done with your attitude. Good luck finding someone who can stand you. There is no easy way to say goodbye to someone you still love. But I just don’t feel like our relationship has a future. It sounds terrible, but sometimes love is not enough to build a happy relationship. I wish you all the best in life. I’ve tried my best to make you feel like you are the most amazing and beautiful human being in the world. Turned out you can do it by yourself perfectly. Take off your crown and be nicer to people. I’ve realized that I don’t love you anymore when I stopped smiling looking at your face every single morning. Maybe I was wrong thinking that this is something special. I feel very sorry for making you think that we will be together forever, I just don’t feel like you are someone I want to spend the rest of my life with. I just cannot forget your lies. 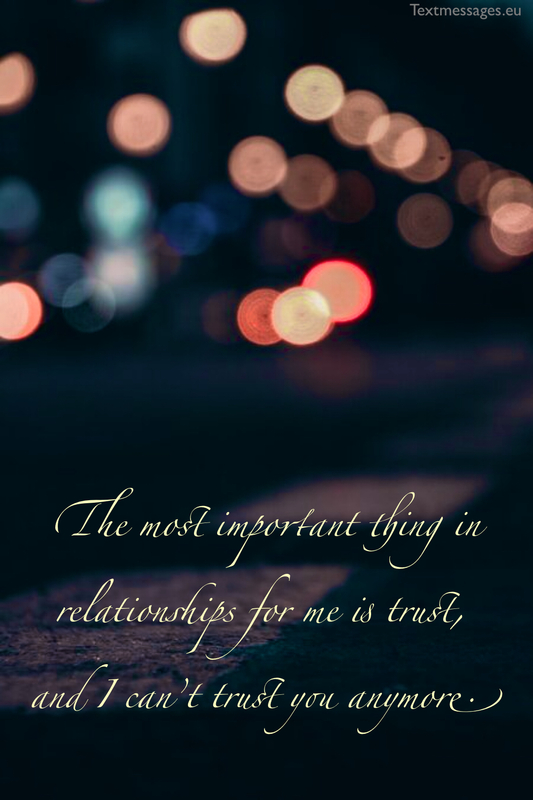 The most important thing in relationships for me is trust, and I can’t trust you anymore. I don’t see us together in my future. I don’t see you in a white dress by my side. Let’s just end it right now. All this time I loved you as I have never loved anyone else before. I really thought that we have a special connection, but apparently, you didn’t feel the same. I can’t be the only one interested in this relationship. Sorry, but I’m done. Breakups are bitter, but it is so much better than living in toxic relationships. I fell in love with you the moment I saw you. Little did I know you will break my heart into million little pieces. Maybe we just don’t belong together. Good luck. I realized that you don’t belong to me when you started taking me for granted. Love doesn’t work like this. Love is when you are excited to be with someone even on your twenty-fifth anniversary. I think it’s better for us to stay friends. You’ve tried to make me someone else to make our relationship perfect while I thought that it was already perfect. I don’t want to change just to make you love me. I wanted you to love me for who I am. I guess it’s time to say goodbye now. Sometimes I get lost in my own thoughts and feelings, sometimes I just need to be alone for a while. I know that you love me and do everything for me, but I need to take a break in our relationship. Sorry. Today I woke up with the feeling that my heart is empty. Then I looked at you, lying on your side and breathing deeply, and understood that I had no feelings for you. I know that we’ve been together for a long time, but now it’s time to change everything. We need to break up. You can see me through and probably you have already noticed that something has changed between us. It seems that our love has gone… I don’t feel it any more. Do you feel it? Your eyes don’t shine like they did before. We must confess that we’re both unhappy in this relationship. Then why shouldn’t we try to find our true love somewhere else? I never promised you anything, I never promised to love you until the end of my life or marry you… I never promised you all these things because I knew how changeable feelings were and didn’t want to give you false hope. I believe, you’ll get over our breakup very soon and find real happiness. You know, you found me in the darkest times of my life, when I tried to get over my previous relationship. I know you tried your best to heal my wounds, but it still hurts. I’m not sure whether I get better or not, but the only thing I know for sure is that you shouldn’t be with the man who still loves another woman. I’m really sorry. You’re the most beautiful, the smartest, the kindest woman I have ever met. You have so many dreams, goals and ambitions. Everybody loves you and appreciates you really high. And that’s why we should break up. You’re just too perfect for such a simple guy like me. When everything started we promised to be honest to each other. I need to tell you something… I met someone and I fell in love. Please, don’t blame me for it, because I do it myself every day and still can’t help it. I can’t lie to you – to the kindest and the most understanding women I’ve ever met – and that’s why I tell you the truth. Sometimes it’s nobody’s fault when people break up, it just happens. You shouldn’t take it personally, because we are not just right for each other. There’s someone better than me for you in this world. You just have to wait a little bit. Everyday we meet a lot of people: some of them are just bystanders and some of them will join us and share our road. No matter for how long they stay with us, there comes a time to leave. I’m really happy you were my companion for this period of time, but now I feel like it’s time to leave. Thank you for everything. I thought we were meant for each other, but I was mistaken. I thought I was the only one for you, but now I see it was only self-deception. I had no idea how mean and mendacious you were, but now I see. It’s over, find somebody else to fool around. But only now we realize that broken toys were much better than broken hearts. And I cannot hide this pain inside my broken heart. But it hurts even more to know that the person that you love is unhappy with you. Love can be a medicine for any kind of pain. That would heal the pain of the broken heart. But rather as someone who taught me to live after my heart was broken. One day you’ve walked into my life, but then you’ve broken my heart and hurt my soul. Although I don’t mean much to you, I wanted to let you know that I will always love you. I can’t understand why God let us meet, if there is no way for us to stay together. It is clear to me now that you don’t feel the same way for me. As well as nothing can stop me from loving you. And my love for you will never die. And don’t say that you don’t love someone, if you cannot let him go. Someone once said that in every relationship one person always loves a little bit more than the other. I think that I am that person. But I can’t give my all and receive nothing. I love you, but I don’t want to live in this destructive relationship anymore. You could’ve told me that you’re not sure whether you love me or not. It breaks my heart to know that you’re in doubt, but your lies have made everything even worse. I can’t be with you knowing that I will never trust you the way I used to. Being your boyfriend is a full-time job. I want to be able to relax with my girlfriend, and you are just not the right person for that. I don’t think that we can make it work. Good luck. I don’t want you to be sad just because our relationship ended. Life goes on, and you’ll have a lot of amazing precious moments in your future, so stop thinking about the bad sides. Everything is going to be okay. The fact that we’re breaking up doesn’t mean that I hate you. Just like the fact that you’ve dated me doesn’t mean that you’ve loved me. I wish you all the best in life. I will always remember you, and I hope that you will remember me too. I remember the first time I said “hi” to you, but now It’s time to say “goodbye”. It’s nobody’s fault, we’re just too different. I believe you’re better off without me as well as I’m better off without you. I would like to stay friends because you still mean a lot to me. If you believe in fate, then you should believe that somewhere on this planet there’s a man who’s made for you and he’s waiting for you to break up with your arrogant boyfriend (me) and go straight to his arms. We’re not right for each other and you know it. Be happy. I’m not afraid to lose people because actually I never lose them. The part of them stays with me, in my heart. I’m sorry darling, but we have to break up. I don’t think this is going to work. I have always lived by this injunction that we can and should change the unfavourable circumstances or something we simply didn’t enjoy. Our relationship doesn’t bring me love. And the only thing I can is to try to find it in some other place. I believe you’ll be happy without me. There’s nothing worse than trying to revive the relationship that is already dead. We just have to admit it and move on. I really feel like we should break up and walk our own ways. You can’t blame me for letting us go now, cause I feel like you let go a long time ago. It’s hard for me to look into your eyes and not feel butterflies in my stomach. I used to think that you are the love of my life, but now I know that I have to keep searching. I don’t regret asking you to be my girlfriend. What we had was magical and unforgettable, but sometimes people just don’t belong together. It’s hard for me to accept that, but I know we will feel better dating someone else. Wishing you the best of all. It is important to admit that you are wrong when you screwed up. But you never did. You were convinced that it’s my fault that our relationship is falling apart. But guess what? I’m tired of being the only one to blame. Goodbye and good luck. I feel like you’ve built a giant wall between us. You don’t want to see me as much, don’t want to talk to me the way we used to do when it all started. I would like us to be together, but I don’t think you do. So I’ll be the first to say goodbye. Breaking up is hard, but being with you is harder. I still have feelings for you, but I just don’t feel that we can make it work without you being entered in it. We are too different. I hope that you will find someone who can give you the world. Rather than watch you loving somebody else in front of me. It doesn’t make me sad. That hurts most of all. But because this relation cases too much pain. And now it is death when I lost you. I cared about you, but you did not. And when I cried, you could smile and laugh. Now I‘m moving on, and you finally realised. Although I’m single now, but emotionally I am completely taken, because my heart will always belong to you. You can ask my eyes to stop looking at you. Or you can ask my mind to stop thinking of you. You can even ask my heart to stop beating. But you will never stop me from loving you. Our love is like a mirror, even though it is broken to a thousand pieces, if you look closely – you can see us in all those pieces. My heart is crying, because I am not with you anymore. Someone like you can never be forgotten.